I don't think I ever met a rye IPA that I didn't like. India Pale Ales made with rye grains come across to me as tough and competent, a beer that in human form would have worked for a few years at the ragged edge of civilisation, then returned to a sedate urban lifestyle but never did stop carrying that Bowie knife. Red Rye IPA (from Twickenham Fine Ales, and my first taste of this brewery's produce) promises a wilderness roam with its simple and subdued forest and mountain label art. The initial scent does not disappoint; pine, peach and apricot are all present, hiking gear strapped to their bodies in preparation for arboreal adventure. The pour is lean and pale honey. The glass soon holds 330ml of dirty ruby, with a thin head that quickly shrinks to a little archipelago of thin foam islands in the centre of the beery sea. The glass is ringed with pinkish bubbles and the scent that rises is pine with the slightest tropical tinge. There is sappiness and a stage-whisper of dark woodland dank on the nose. The weedy stench, even a tiny slice of it, is a starting pistol to your correspondent's thirst. The first mouthful passed the sensors with no analysis at all. Head back and straight down. Regaining some composure, the second mouthful gives an adherent and cloying mouthfeel, piney sap in full bug-ensnaring effect. To hold the beer in the mouth is to receive a jolt of citrus as the fruits in the flavour profile overpower the carbonation, and the spicy smack of the rye is clearly evident in the aftertaste. With two fingers of beer left in the glass, the scent becomes riper, dancing on the sweet and slender line between richness and decay. Moss overcoming abandoned forest shacks. Dachas in Russia's wilderness falling into forgotten disrepair, bears nesting in their dark-wood corridors. The feel of the beer seems to become thinner towards the end of the glass. The taste a lighter, simpler pine as the nose becomes richer and fuller, the air in the room seemingly gulping the beer's essence faster than this reporter can. Joyously killing the beer in a final glug sends the pure taste of pine down to digestive Hell, while the spice and well-worn, wood-wise grit take up residence in the wilds of the skull. 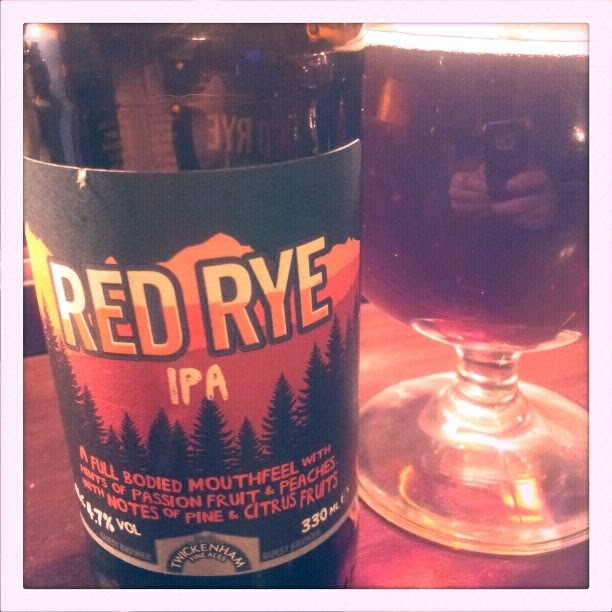 I have still never met a rye IPA I didn't like, and I'm incredibly relieved at this.